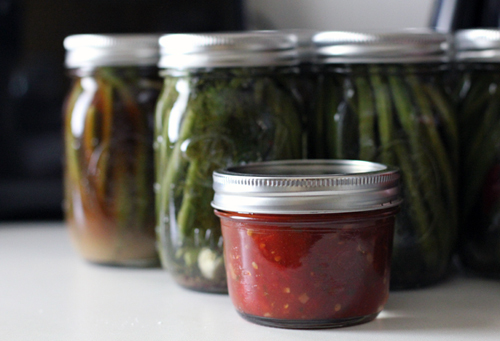 Maybe it’s the crisping of the morning air telling me the end of the harvest is creeping up on us, but I couldn’t resist an urge to stuff things into glass jars this weekend. I made up a batch of yogurt with my market milk and, in response to family demand, did up a final round of my usual pickled green beans, plus a wasabi (!) version. Now every time I open the fridge, I’m tempted to open a jar and taste one for “readiness”. This week the market also boasted mounds of apples, $10 a basket full, though since I’m not generally a sweets person, fruit preservation is not high on my list of priorities. However, I have had a craving for tomato jam ever since I tried it out at Woodberry Kitchen a few weeks ago. This unstrained version which I found in the NYTimes via the Wednesday Chef seemed like it would suit perfectly. Aside from some occasional stirring during its 90-minute cook time, it took pretty much no effort until I got a little sloppy pouring the hot liquid from the very hot pan into the small containers. Lesson learned. Product review: It’s so amazingly spicy (thank you, garden jalapeno!) and sweet and tomato-y, this is a condiment that’s bound to go fast. Used as a pizza topping last night and a scrambled egg dresser-upper this a.m., I have already seriously dented the jar. I may have to rethink sharing. Tomato jam = salsa ??? Probably not, but I had to ask. Hmm, consistency/bite-wise, I’d say it’s on par with a chunky strawberry jam. It’s the cooking that probably makes it distinctive, and the sugar/heat tension.